Mason jars are used for practically everything nowadays, including making homemade rock candy to decorations for Halloween. 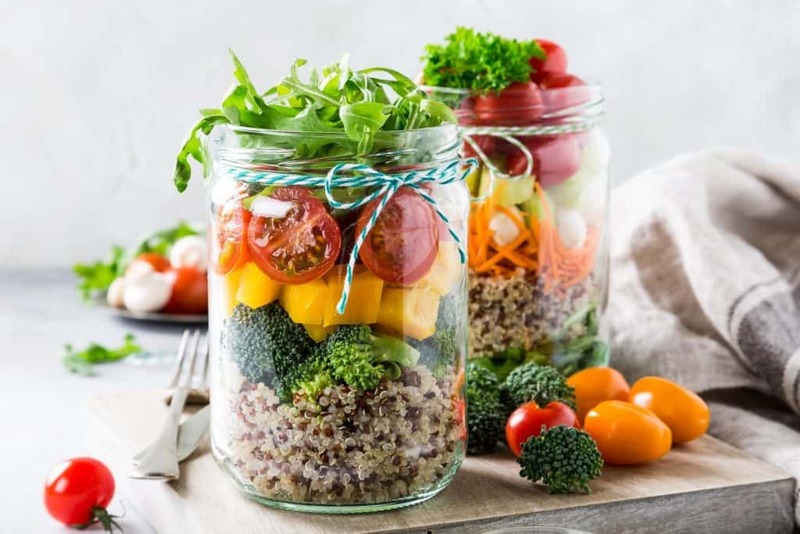 If you have a few mason jars laying around, you can also use them to make mindful school lunches for your kids. Listed below are just a few options. Pizza pasta mason jar shaker. What kid wouldn’t love to have pizza for lunch? Be the best parent on the block by serving a creative pizza-like meal in a jar. This recipe from Babble layers a mason jar with mini cheese tortellini pasta, fresh tomatoes, finely chopped basil or spinach, olives, mini pepperoni, and Italian dressing. Click this link for the yummy recipe. Cheeseburger mason jar salad. Do your kids prefer burgers over pizza? If so, consider creating a burger jar instead. This recipe from 4 Sons R Us is made with lean ground beef, ketchup, mustard, tomatoes, dill pickles, red onion, cheddar cheese, lettuce, and Thousand Island dressing. If you’re looking for a healthier meat choice, try lean turkey meat or a tasty meat substitute option. For the full recipe, click this link. Taco salad in a jar. Spice up your children’s lunch with a jar filled with traditional taco ingredients. For the bottom to the top layer your jar with beans seasoned with taco seasoning, corn, salsa, guacamole, and chips. The recipe for this quick and delicious lunch is listed here. Hummus and veggie snack. Trying to encourage your kids to eat more vegetables? How about making a fun, colorful lunch with hummus. Fill the bottom of the jar with yummy hummus of your choosing. Then fill the jar with long slices of vegetables such as carrot sticks, bell pepper slices, snap peas, and celery sticks. Triple berry and nut salad. This yummy fruit salad consists of roasted almonds and three berries: strawberries, blackberries, and blueberries. This salad also has a simple homemade dressing—all you need is lemon juice, lemon zest, olive oil, and honey. To make this salad simply mix your dressing in the bottom of the jar, then layer the berries and nuts on top. When your kids are ready to eat all they have to do is shake and eat. You can find instructions for the recipe here. Bonus. To keep these yummy meals cool or hot, consider investing in thermal lunch boxes for your kids. Or you can pack an ice pack or heating pack with their food.